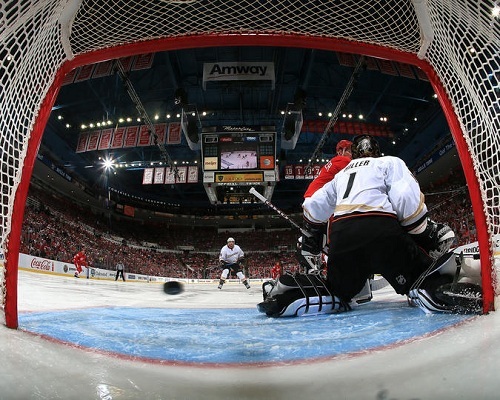 After five games against Detroit in the 2013 Stanley Cup Quarterfinals, the Anaheim Ducks went into Joe Louis Arena leading the series three games to two. The two teams have been in a fierce battle for superiority and thus far it has not failed to disappoint fans on either side. It has been particularly exciting, as a Ducks fan, to see the team preform so well against the Detroit Red Wings–who have been an obstacle of Herculean proportions for Anaheim in the playoffs for as long as I can remember. In the opening period, both teams started out fairly strong with smothering defense and very little breakaway plays. It was not until eleven minutes into the first that Kyle Palmieri was credited with the first goal of the night; it was truly remarkable to watch as his shot deflected off the crossbar of Howard’s goal and hit Brendan Smith, who was attempting to assist his goaltender, and go straight into the net. It was not until the second period that Pavil Datsyuk managed to get a point up for Detroit with the help of Henrik Zetterberg and Jonathan Ericsson. The game would be tied one to one through the remainder of the middle period and into the third. The Red Wings came into the third period strong with a lot of pressure on Anaheim’s net. There were many close calls as Anaheim could barely manage to get control of the puck. Halfway through the third alone, Detroit out shot the Ducks seventeen to five. With thirteen minutes left in the final period, Zetterberg scored on Detroit’s second power play of the night with the help of Johan Franzen. For the remainder of the game, the Red Wings would use a very simple formula that proved itself effective against the Ducks–a giant defense man such as Franzen, would block Jonas Hiller and then whoever had possession of the puck would lob it at the goal with little difficulty. Two minutes after the Ducks came back to full strength, Andrew Cogliano was put in the penalty box for tripping Pavil Datsyuk; this gave Detroit yet another power play opportunity. The officials of the game seemed to overlook a lot of blatant calls on both teams and yet Anaheim received three penalties while Detroit received zero–a frustrating thing to happen to the number one power play killing team in the NHL don’t you think? The Ducks managed to kill that final opportunity, but with just eight minutes left in the third period Justin Abdelkader widened the gap for Detroit. DETROIT, MI – MAY 10: Goalie Jonas Hiller #1 of the Anaheim Ducks gets beat by a Henrik Zetterberg #40 (not pictured) of the Detroit Red Wings shot in overtime of Game Six of the Western Conference Quarterfinals during the 2013 NHL Stanley Cup Playoffs at Joe Louis Arena on May 10, 2013 in Detroit, Michigan. Detroit defeated Anaheim 4-3 in overtime. With only eight minutes left in the game, hope was fading for Anaheim. The time on the clock shrank down and it seemed inevitable that the series would go into game seven. Then Emerson Etem miraculously broke the puck away and scored to make it a one point game with only three minutes remaining. Unbelievably, exactly fifty-three seconds after Etem’s heroic goal, Corey Perry set up a beautiful goal for Bobby Ryan in a mad struggle in front of Detroit’s net. Zetterberg came close to reclaiming Detroit’s victory, but his shot on goal hit the post before Ryan Getzlaf took control of it and was called offside with thirty seconds remaining. Game six would go into overtime–something that Bruce Boudreau was not particularly happy about; he was well aware that his team had gotten very lucky in those last minutes and to give the Red Wings a chance to regroup was not ideal. Less than a minute into overtime, Zetterberg redeemed himself with the game winning goal for Detroit using the same method as discussed earlier. What hope the Ducks had of claiming the series in game six was lost. They will return home to the Honda Center tomorrow to face the Red Wings for the final time in game seven.